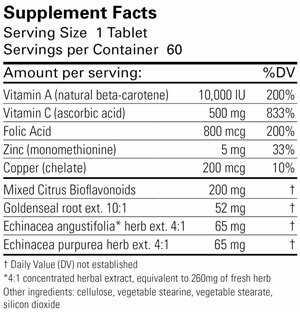 Echinacea Plus combines a well-researched botanical pair and several vitamins, minerals, and phytonutrients into a comprehensive formula for immune support. Both Echinacea purpurea and Echinacea angustifolia contain polysaccharides that stimulate macrophage activation and cytokine production. 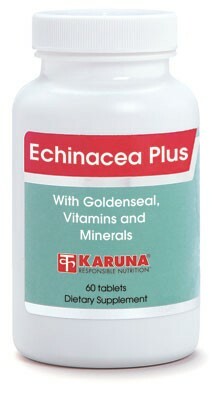 Echinacea Plus also contains goldenseal, a rich source of berberine, which exerts antagonistic effects on microbial metabolism and stimulates the humoral immune response by increasing immunoglobulin production. Vitamin C, bioflavonoids, vitamin A, folic acid and zinc (with balancing copper) are included to provide complete immune support. Refer to About...Echinacea and Goldenseal. to both the cellular and the humoral immune system. Several micronutrients, including vitamins A and C, beta-carotene, folic acid, copper and zinc, play vital roles in supporting normal immune function (Br J Nutr 2001;85:S75-80; Am J Clin Nutr 1997;66:460S-63S). Suggested use for adults: 2-8 tablets daily, in divided doses, or as directed.